BRADBURY ASSET MANAGEMENT (HONG KONG) LIMITED ("BAMHK"), has strategic cooperation with 6 major international private banks, where BAMHK is their approved independent asset manager, to provide our clients with world-class investment products and advisory services with the support of these banks’ resources. These professional EAM services are popular among family offices, institutional clients and ultra-high net worth individuals in Switzerland and are gaining popularity in the Asia region. 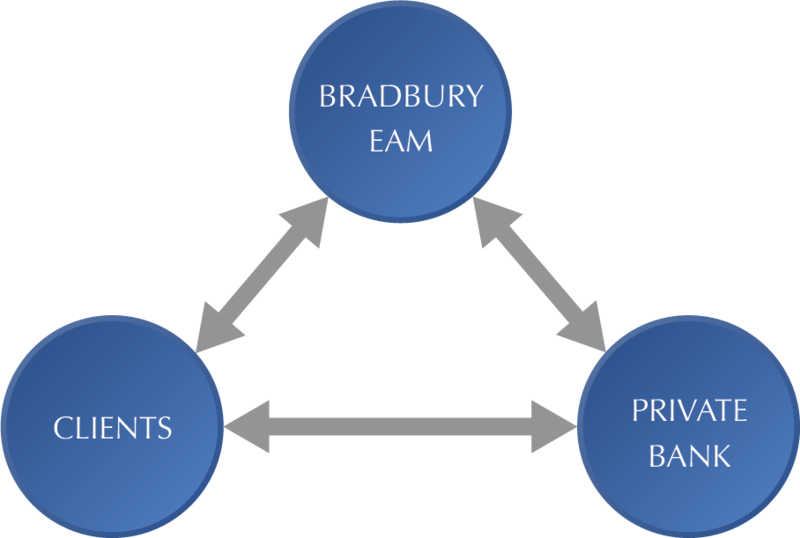 Under this EAM model, it create a win-win strategy for the clients, the asset manager and the banks. First, the client opens a bank account in his/her name and it holds only the client’s assets and remains under their ownership at all times. The asset manager evaluates and determines the client’s investment objectives and risk tolerance upon which become the basis for the investment portfolio. The asset manager utilise its expertise to manage the client’s account after client awarded them the LPOA. The banks will book the client’s assets on their platform and continue to provide custody and brokerage services.